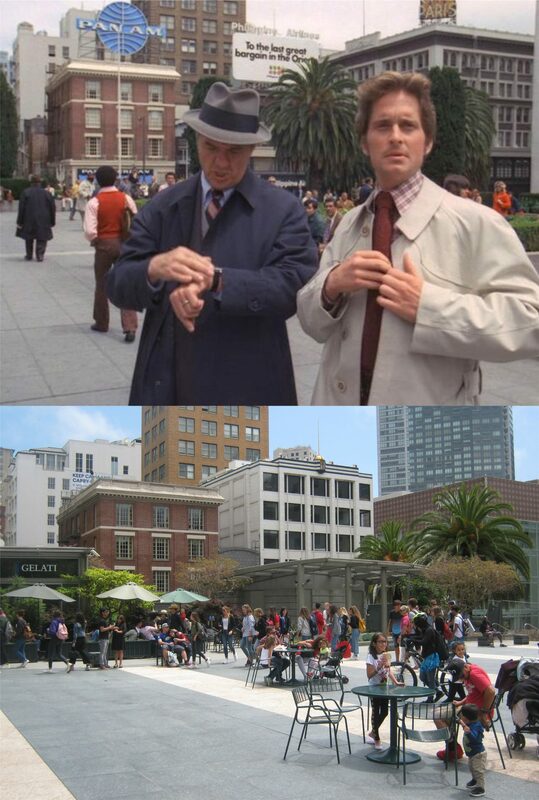 The following collection are crime scenes, both real and from the movies at San Francisco locations. In this remarkable photo from Hannah Clayborn’s ‘Historic Photos of San Francisco Crime’ Roman Rodriguez (sitting on the lawn between the police) reenacts the murder of 16 year old Hilda Pagan on March 25, 1952 at Dolores Park. As Pagan passed by him, he called her up to sit with him on top of the ledge at the left. Later, they climbed down to the lawn below to “embrace” where he beat and strangled her. The lady with her hands to her face may be Hilda’s mother. A top addition has been added to where the two sat, and it’s now the Dolores Park restroom. Update, November 22, 2015: Since I took the top picture of the Hilde Pagan murder spot, the building where Roman Rodriguez murdered her has been demolished due to the Dolores Park renovations.